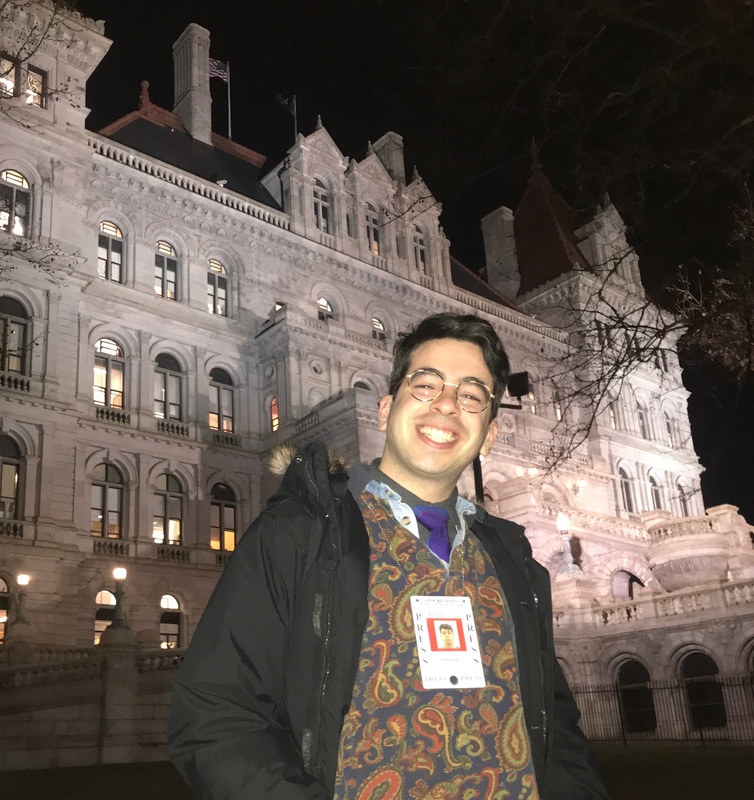 ALBANY — Streetsblog’s David Meyer and Gersh Kuntzman remain in the state capital, where Gov. Cuomo will deliver his State of the State address later today. To recap, we spent all day Monday interviewing lawmakers about their bizarre reluctance to get behind congestion pricing, which could create a new stream of funding for mass transit while discouraging automobile use in Manhattan (the term “win-win” comes to mind). It made for some interesting reading. Meanwhile, can we just say that the State Capitol is one of the great buildings in America? It feels like the entire structure was hand-carved out of a single mountain of Italian marble. The walls of the State Senate chamber are literally gilded! There are wood desks from the 1800s! The art on the walls isn’t merely from the Hudson River School — it’s a collection so great that it should be called the Hudson River grad school! The place is a 13th-century Austro-Hungarian castle! OK, you get the idea. Say it ain’t so: Gothamist decided to listen to a lot of NIMBYs on Grand Street in Bushwick who want “their” parking spaces back. Meanwhile, cyclist and journalist Steve Bodzin had the Twitter thread of the day. If you’ve ever struggled to articulate why you hate FedEx and UPS in your bike lanes, Bodzin explains that you’re not only upset to be endangered by a truck, but you’re upset that delivery companies are making us pay to support an untenable economic model. A new episode of War on Cars is out — this one looks at the similarity between cars and guns. Lots of outlets hailed Mayor de Blasio’s ferry good news about more routes. Patch was optimistic, though did mention the $100 million in new capital costs for a system that is not yet widely used. The Daily News was pessimistic, as was the Post. Finally, we leave you with this picture of David Meyer at the Capitol. See how happy he is? I agree, beautiful building. Much too nice for the type of leaders we have there now. We should put them in a barn until they start serving the people who paid for that lovely edifice. So what would the suburban counties pay out of local taxes for the MTA Capital Plan? That’s where a lot of the funds have been expended, and that’s where a lot of the people who have benefitted from overcharging for capital projects in the city live. Or lived, before they moved to Florida. The whole picture needs to be looked at, especially since suburban Buffalo re-elected Chris Collins. Why is NYC the only place in the state with no municipal aid from the state? We pay state taxes so the Hamptons can get it. Why is NYC forced to pay a higher share of Medicaid spending within NYC with local taxes than counties elsewhere in the state are forced to pay? Why was the already unfair deal under which the city turned over the TBTA and its toll surplus to the MTA routinely ignored, with a higher share going to the suburban railroads? Why are LIRR workers allowed to be away with featherbedding, disability fraud, and a host of other unfairnesses far in excess of any other transit system in the U.S., and why is service cut on the subway to pay for it? Why did NYC receive an unfairly low share of state school aid for 30 years, and at the very moment that was corrected, UFT teachers were retroactively granted retirement at age 55 after 25 years instead of 62 after 30, sucking all the additional money out of the classroom? Why are localities everywhere else in the state allowed to limit their local jobs to residents, but not NYC, by state law? And why don’t our state “representatives” have a problem with any of this? The building came in way over budget due to corruption — back before the year 1900. Nope. The RA data show that on 92% of workday mornings in 2018, one or more subway commutes experienced delays. That’s a far cry from the amNY hed and your precis (“The Riders Alliance showed just how bad the subway is, with 92 percent morning commutes delayed.”).